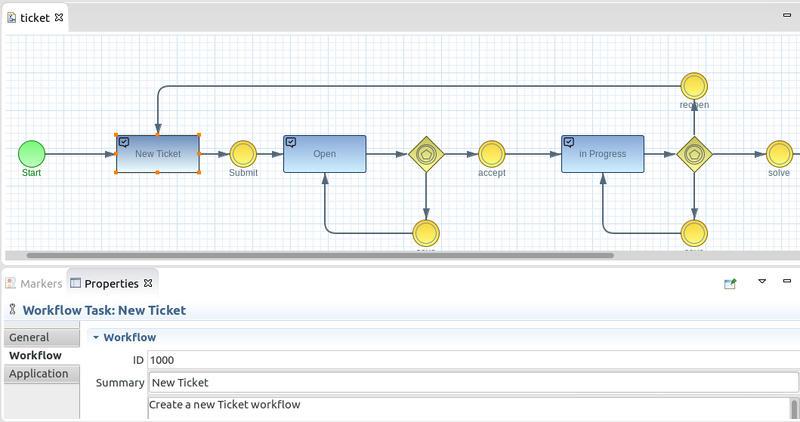 Imixs-Workflow supports the BPMN 2.0 standard and simplifies the way to design and execute business logic. The 'Business Process Model and Notation' - BPMN 2.0 is the common standard to describe a business process. BPMN was initially designed to describe a business process without all the technical details of a software system. As an result, a BPMN diagram is easy to understand and a good starting point to talk about a business process with technician as also with management people. Imixs-BPMN is a free modeling tool which takes the full advantage of all the capabilities of BPMN 2.0 and complements them with the features of a powerful workflow engine. Imixs-BPMN is a Eclipse Plugin which enhances the Eclipse BPMN2 Modeling Framework. With Imixs-BPMN you get maximum flexibility to describe, model and execute your business processes. Workflow modeling means describing a business process with its various tasks and events when actors interact within the process. Beside the general description of a business process with BPMN, there are a lot of technical aspects which are typical to a workflow management system. For example a task can be distributed automatically by email to different users or open issues can be organized in a user friendly task list - like messages in an email in-box. Imixs-Workflow take control of each task from the starting point until it is finished. As Imixs-Worklfow is a human-centric business process management solution, the modeling concept in Imixs-BPMN is event-driven. An event can be triggered by an actor as also from an external service or IT system. The Imixs-Workflow engine automatically execute different workflow functions when a event was received and persists the state and business data of the process . As a result, a process instance in Imixs-Workflow is always in a defined state throughout the life cycle of a business process. Read more about how to model with Imixs-BPMN. Imixs-BPMN extends the BPMN 2.0 standard in the way that the execution and processing information can be added to any BPMN compliant model without restricting the flexibility and openness of BPMN. The Imixs-BPMN Task Element is an extension to the BPMN Task Element and can be used to describe a Workflow Task inside a workflow model. Typically the Task Element reflects the task to be processed by a participant in a defined workflow status. The Imixs-BPMN Task Element contains a custom set of properties used to describe the status of a process instance controlled by the Imixs-Workflow engine. Read more about the Task element. The Imixs-BPMN Event Element extends to the BPMN 2.0 CatchEvent and can be used to describe a transition from one Workflow Task into another. The Imixs-BPMN Event contains a set of extended properties to be evaluated and executed by the Imixs-Workflow engine. Read more about the Event element. The Imixs Eclipse Modeler allows you to control your business process without changing one line of application code.